Professional Quality Custom Size Wood Frames Made Easy. Corner Brackets® are packaged 4 to a pack with eight brass wood screws and assembly instructions. Frame Sides are packaged 2 to a pack, come pre-sanded, and are finish ready. Just cut to length and assemble with Corner Brackets. The ordering tool below will prompt you to select a horizontal and a vertical length. Feel free to mix and match wood species between the Corner Bracket & Sides. We suggest selecting the same species for the horizontal and vertical sides. NOTE: Walnut Brackets vary greatly in color. Some may be lighter or darker than pictured in the product photos. 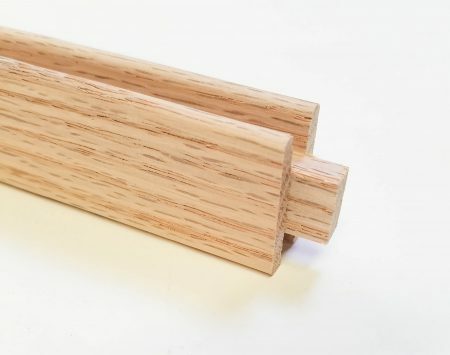 You can also buy our 1-3/8″ wide oak frame stock in the lengths you need and follow our cutting instructions below. The corner brackets ONLY FIT the 1-3/8″ framing stock. 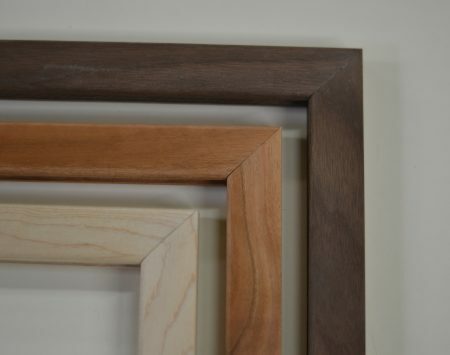 Frame materials are available in most other hardwoods, including Birch, Cherry, Maple, or Ash. Call for pricing at 612-789-2990. You will need: Miter Saw, Electric Drill, 5/64 Drill Bit, Wood Glue, Phillips Head Screw Driver. 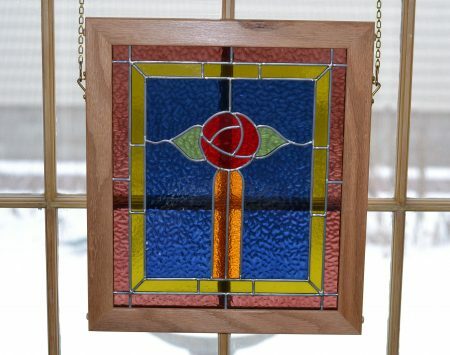 1.Cutting the Frame Sides to length: Measure the art glass height and width; cut two frame sides 2″ longer than the height; cut the other two frame sides 3/4″ shorter than the width. Pre-assemble your frame and brackets (without screws or glue) around the art glass to insure proper fit. **Do not force the pieces to fit into the bracket. As wood is a natural product, it can vary in size a bit. You may need to sand down the ends of the frame sides slightly, so they will fit into the bracket easier. Snug is fine, but too tight may cause the bracket wood to crack. 2.Assembling the Frame (Do all assembly on a flat surface): Spread a few drops of wood glue on all six surfaces inside one Corner Bracket; push one frame side into bracket snugly; follow the same process with the other brackets being sure to install the art glass after assembling three Frame Sides, then assemble the fourth Frame Side and remaining brackets. Allow glue to dry before you pre-drill screw holes with a 5/64 drill bit. Screw in brass screws to complete your frame. *NOTE: For ease in installing the screws, run the threads over a bar of soap or wax. For easy hanging, try our chain hooks.